From Monday 23rd July until Sunday 2nd September, Alton Towers will be hosting their annual summer special event. This season, in a change from the usual Summer Spectacular performed by the Royal Marines Commandos, Team Extreme, and extreme sports display team, will be performing regular shows in the park. The display team is made up of a group of professional extreme sportsmen and women, them all being some of the top competitors in their kind of sport. Mike Mullen was the 1994 World Amateur champion and has considerable competition experience winning the premier UK event, King of Concrete in 1996 . He is also then 1998 World Masterclass Champion. Pill is the 1998 King of Concrete. He also won Pro bowls and Pro spine at Southsea in September 2000. Crazy Denis is the man for the most unexpected tricks, suddenly throwing in a back flip, on the jump ramp, half-pipe or even the mini-ramp. 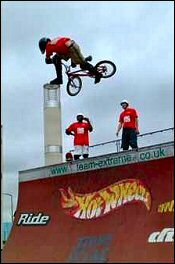 He won the King of Concrete event at Southsea in September 2000. Gadget is the Teams Star Snakeboarder and is the UK's best. An unusual sport, he performs a wide range of varied tricks on both mini and Vert ramps. 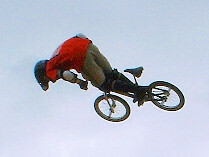 He is the current British Vert Champion. The team will be performing several times a day in the park, depending on the weather, and will be performing (we are told), something extra special for the Alton Towers audiences. The team will soon be appearing on Record Breakers on the BBC. Don't forget to buy your £6 car parking token from Guest Services.